Fifty years since he participated in the Eurovision Song Contest with “Congratulations”, and sixty years since his music career began, Cliff Richard is still going strong with more chart-topping songs than any other artist. Now, in support of blood cancer charity Bloodwise, you can own a unique, hand signed flag to mark the anniversary of Britain’s biggest pop star. 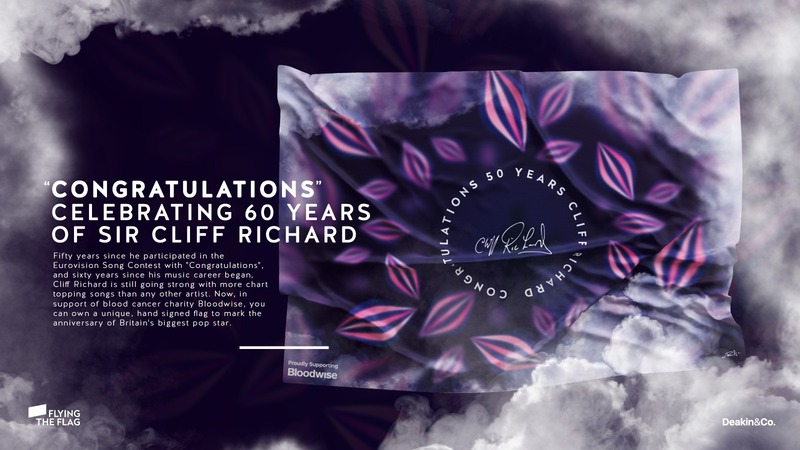 Sir Cliff Richard | Congratulations! Picture the scene – it’s August 6th 1968, Harold Wilson is the British Prime Minister, Tommy James and The Shondells are number one in the UK charts with ‘Mony Mony’, Manchester United are football’s reigning European Cup holders and 27-year-old Cliff Richard says ‘Congratulations’ as he represents the United Kingdom in the 13th Eurovision Song Contest, going on to do what no country does better than the UK in Eurovision – finish second. However, it’s not the finishing second part that we should reflect on… it’s the fact that even 50 years after his glorious performance at the Royal Albert Hall, Sir Cliff Richard is still very much a part of the Eurovision family. Following in the footsteps of 1967’s Eurovision winner, Sandie Shaw, was always going to be difficult, but it’s fair to say that Sir Cliff was a wonderful ambassador for the UK in a contest shrouded in political controversy. Nonetheless, Eurovision 1968 broke boundaries in so many ways – it was the third time that the late, great Katie Boyle presented the contest and also the first Eurovision ever to be broadcast in colour. Oh how different the world is now. In 2018, colour TV is taken for granted, smartphones are all the rage, the world seemingly wouldn’t exist without social media and reality TV continues to saturate screens all over the world. Yet, for all that the world has changed in the past 50 years, one thing hasn’t changed – the existence of Eurovision and the love that Sir Cliff Richard has for the contest. 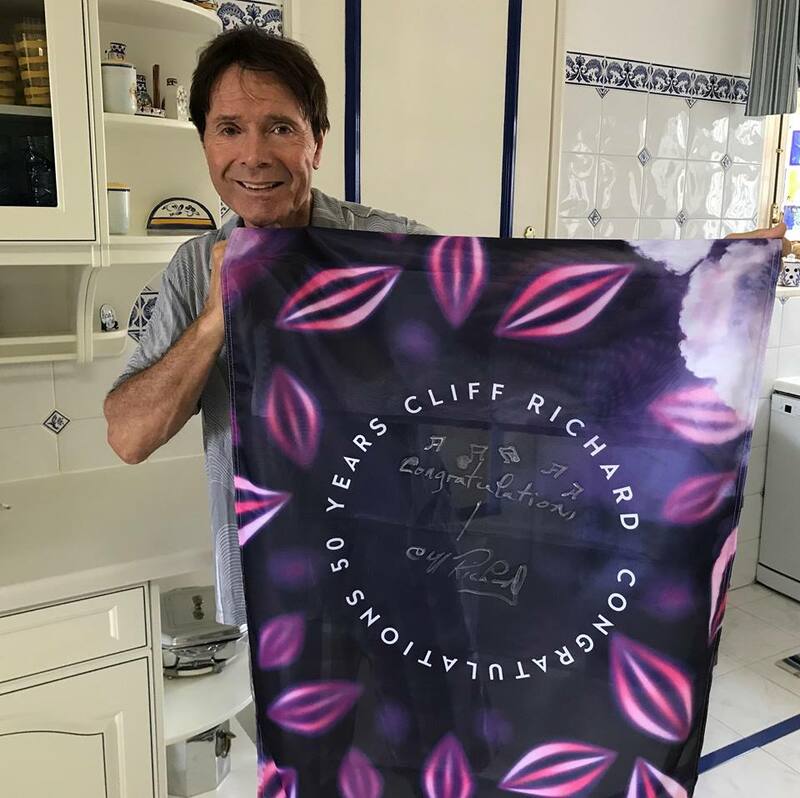 This year’s prize includes the iconic “Congratulations” flag, designed specifically for the occasion and hand signed by Sir Cliff Richard at this year’s Eurovision Song Contest in Portugal this May. The winner of the prize draw will also receive a bottle of Special Reserva wine from Sir Cliff’s vineyard, displayed in a silk-lined themed presentation box. Included in the four-part prize is a signed copy of Sir Cliff’s Platinum Collection CD box set, and a branded “Congratulations” cap. Entering the raffle is easy. Simply visit Congratulations! on the Eurovoix Showcase website and make a donation of £5.00 or more to blood cancer charity, Bloodwise. For every £5.00 you donate, your name will be added to the raffle once. Later this Autumn, one lucky winner’s name will be drawn to win all four prizes on offer in this year’s Flying the Flag charity fundraising campaign. The ‘Flying The Flag’ charity campaigns were born due to Karen, a wife and mother of two children who suffered Acute Myeloid Leukaemia twice. Following a Stem Cell Transplant, from a then unknown German donor in 2012, we are pleased to say that she is now in remission and doing very well and continuing to work full time as a Primary School Teacher. It was quickly realised that without the help of such charities as Bloodwise, Karen and many others would not be here today. Accordingly to try and help those who have or will suffer from this terrible disease it was decided to think of a way that could support the Bloodwise charity in their groundbreaking research and patient and family care. Karen has a love of the Eurovision Song Contest. Accordingly, in 2013, a flag, specially designed by Minipops creator Ben Morris, was signed by all the United Kingdom Winners of Eurovision and also the BBC presenters Graham Norton and the late Sir Terry Wogan. This was followed in 2014 by another flag , which this time was signed by all four members of ABBA, in order to celebrate forty years since they won Eurovision. Our ‘Sound of Vienna’ flag commemorated, the contest in Austria alongside the 50th Anniversary of the film of ‘The Sound of Music’. Both the ‘Sound of Vienna’ flag and this years ‘Congratulations’ flags were designed by Samuel Deakin. We are very grateful to Ben and Samuel who have given their valuable time and talents voluntarily. All the flags were won by the way of an online draw, whose entrants were those who donated to our campaign for Bloodwise. Bloodwise (previously known as Leukaemia & Lymphoma Research) is a UK based charity dedicated to funding research into all blood cancers including leukaemia, lymphoma and myeloma, as well as to offering information and support to blood cancer patients. 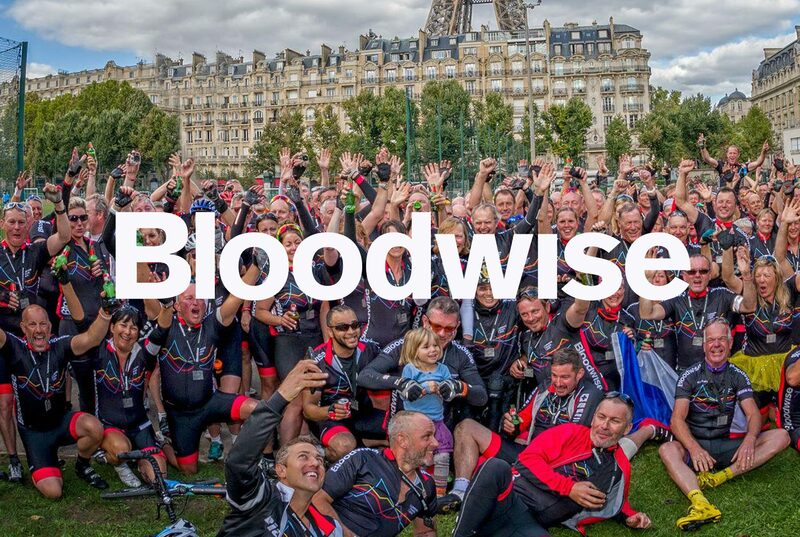 Bloodwise’s vision is to beat blood cancer. They invest money into blood cancer research to ensure that all patients have their disease diagnosed early and accurately, receive personal, targeted treatments which are effective and have minimal side effects in order to beat or manage their cancer. Source: Flying the Flag, Bloodwise, Deakin & Co. Article produced with thanks to Dale Roberts & Martin Hart. Beautiful charity and congrats and God keep blessing the amazing and wonderful artist, Sir Cliff Richard, on his 60th year as a pop rock star! Britains first still going strong!! ‘Congratulations’ Sir Cliff on your 60years in Show Business – you are Our Diamond ???? Looking forward to seeing you in your Concerts in October. “Congratulations”Cliff on your 60thAnniversary,I was 3 in September 1958 and loved listening to you ever since with concerts and wine signings in Portugal, with a great collection of goodies along the way.